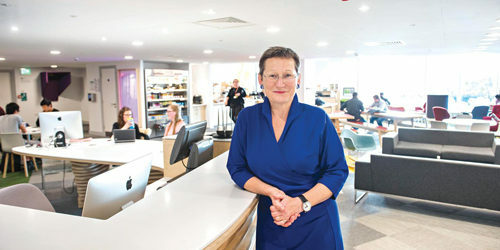 Debra Humphris has been the Vice- Chancellor at the University of Brighton for less than a year, but she has made a big impact already. Straight-talking and ready to embrace change, Debra is determined to strengthen the bond between the university and the wider business and local community. If anyone has been coasting in the sheltered bubble that can often be found in university campus life, they may well have had a bit of a shock. Debra Humphris is on a mission, as she makes clear when we meet to discuss her plans for the university. “I’ve come to an institution where there is a very clear imperative to refresh and renew, and to reassert our role and our purpose in society,” says Debra. “There are numerous opportunities for us. The economic climate and the policy context that we find ourselves in as an institution are changing dramatically, and we must adapt if we are to improve. “We have had a period of flushing out a whole load of things that we need to speak openly about, speaking truth unto the institution and ourselves so that we can rebase and start to move forward. More than ever, the role of a Vice-Chancellor has mirrored that of Chief Executive in a company. The aims may ultimately be different, with educational attainment replacing the search for profits, but the pressure on budgets and tough decisions mean that the two worlds are becoming more intertwined. Pragmatism is the key, and this is an attribute that Debra clearly possesses. But does she see her role as primarily a Vice-Chancellor or a Chief Executive? “I’m an academic, so I’m a Vice-Chancellor first and foremost. But absolutely, I am also the Chief Executive. I am responsible for a £200 million business, 21,000 students and 2,800 staff – no pressure there, then! “But my primary focus is always on our students . We owe it to them to give them the best possible education and experience that we can. It may surprise some to learn that 73% of our income now comes from student tuition fees. So it’s very evident who we should be paying attention to. People now invest in their education, and they think about it as an investment. “You can’t buy a degree - you have to work for a degree. It’s very much a partnership. As a student you join our academic community and we create the conditions for you to realise your potential – to shape your future. You can buy an expensive text book, but you have to put the effort in if you want to get the value out. Enabling the students and creating the right environment for them to succeed would be a much simpler outcome if funds were unlimited. There is no such luxury, and educational institutions have to make tough decisions. Perhaps the biggest dilemma that Debra has faced so far is the future of the university campus at Hastings, which has been running at an annual loss of around £1.2 million. On announcing that the future of the campus was up for review, Debra has faced a barrage of criticism. Debra says, “A number of universities across the country are having to make some tough, serious changes because the economic context of universities has changed quite considerably. The model that we currently have in Hastings was predicated on a certain number of students and before the changes to fees being there. We have sadly never met that target, and it’s unlikely despite our best efforts that we ever will; it’s just not financially sustainable. Our staff in Hastings have put in huge amounts of effort and commitment, but we only have a certain amount of income and we don’t get a big grant from the Funding Council anymore. We have to make some really tough decisions for the institution as a whole. “We want to evolve the way we deliver higher education in Hastings and do it in partnership with colleagues at the Sussex Coast College Hastings to create a locally appropriate higher education offering. They already deliver higher education and degrees accredited by the University of Brighton, so there remains higher education in Hastings. If the emphasis of the interview has been about tough decisions and pragmatism, this is only part of Debra’s story. She is committed to helping create a fairer society with an emphasis on greater social mobility. It is this ethos which influenced her decision to take on the Brighton role. She began her career as a nurse and worked in the NHS before doing a PhD at St George’s Hospital Medical School Tooting, establishing with a colleague the Healthcare Evaluation Unit. Her focus was on how you change clinical practice in evidence-based health care. This was in the early days of evidence-based practice in medicine and health care, and the unit became the National Institute for Clinical Excellence. Later, she established the Health Care Innovation Unit at the University of Southampton before becoming the Pro-Vice-Chancellor for Education at the University of Southampton. In a similar vein, as the first female openly gay Vice-Chancellor, Debra is keen to promote diversity and opportunities for female students in sectors where they have often been underrepresented. The university is committed to the Athena SWAN Charter, which was established in 2005 to encourage and recognise commitment to advancing the careers of women in science, technology, engineering, maths and medicine (STEMM) employment in higher education and research. “It’s about gender equality,” explains Debra. “It is about women in engineering and it’s equally about men in female-dominated areas. I’m delighted that our new Pro-Vice-Chancellor for Research will be the first leading woman taking the research brief in this institution. One community that Debra is building connections with is the business community, and key to the future engagement is a new proposed Business School on the long-anticipated Moulsecoombe development on Brighton’s Lewes Road. What is the remit for the new school? “There’s a difference between a building and an academic vision for business. Thinking about the academic vision for the Business School, the element we are clear about is that the school will be open to and for business. We’ve had some really interesting conversations about how, in many institutions, you’ll see science parks. We should think about having a business park where people who want flexible space can come in and use a co-working space. They may want to hire a desk and for it to be in an open working environment in which there are other people sharing ideas and doing similar things; facilities, coffee machines that spark conversations and connections. This is the sort of modern business environment for start-ups, and I’m very interested to explore how we do that with partners in the business community. “Every year The CBI produces a report which highlights this issue, and every year we ask employers what it is they want us to do, and what we should put in the curriculum to add to the educational experience. And that’s when it gets just a bit trickier, because they’re not quite sure what things they specifically want. So, the closer we work, the more likely we are to come up with a better solution, and placement opportunities will be key. “Part of our future strategy is enhancing that partnership that we have with employers to understand what the skills are that they’re looking for. Some of this is just about the attitude of the graduate - about turning up on time, how they work together in a team. And we can mirror that to a certain extent in the undergraduate experience. But it’s never going to be quite like the reality of going into a work environment. What do you think the effect of Brexit is going to be on the university? 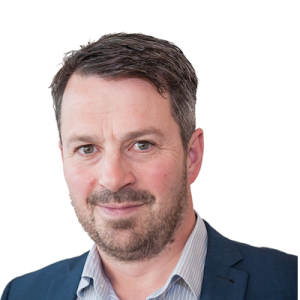 “We’re part of Universities UK (effectively the universities’ lobby group), and I was one of the 100 Vice-Chancellors who signed the letter saying this is just not a good thing for the UK and our education. There are a number of fundamental worries. In terms of research funding, we do well out of Horizon 2020, and the EU Research Council funding. We’re the better and richer for it in terms of that intellectual activity. I don’t think anybody in the HE sector has any confidence that, post-Brexit, there’s going to be any greater investment in the UK research councils. What’s the working relationship with the University of Sussex? Like Brighton, they have just appointed a new Vice-Chancellor. Education has been in the news, with the new Prime Minister talking about grammar schools, and also about how universities should be involved with their local schools. In her first major speech as Prime Minister, Theresa May praised the University of Brighton for its commitment and track record in raising the aspirations of school students through its support for academy schools. Many thanks to Debra for sparing the time in her busy schedule. The interview is only a brief summary of the conversation. We have the feeling that Debra will make a significant impact on the university and education in the region. Watch this space!